The Wooden Trough Lowcountry Chandelier draws inspiration from the old timey troughs that feed cattle. 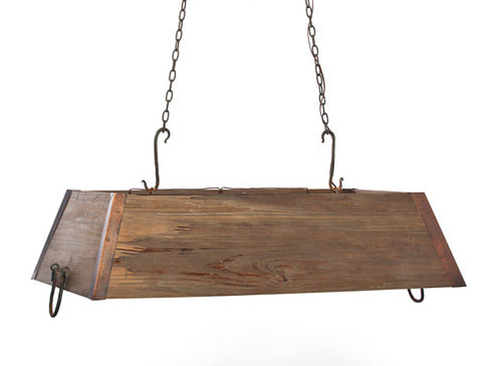 The hand forged side handles and "S" hooks give this piece an authentic vintage charm. The hooks are forged in steel painted black and the chain is steel. The piece measures 46"L x 26"W x 12"H and takes three 100 watt bulbs. Please supply to ceiling height & the chain height you prefer. The chain height + the height of the piece will give you an overall height for your light.